Relationships among people start with greetings at the beginning of the day. Sometimes we say “Bonjour!”. If “Contemporary” is the word to define the era which continue “now” and started by the iconic event. After the World War 2 imperialism fell down , and after the Cold War communitarianism fell down. Capitalism is doing well anyway. “Civilizations” remind us the foundation of a certain social system. For example, the town has got better quality of health care by the improvement of water supply and sewerage systems. And, the publications by paper gave wisdom to masses of people. And, farming technology brought us food security and permanent residence. To summarize, when we say “Bonjour! ‘Gendai Bunmei’ (contemporary civilizations)”, we consider it as a place to continuously make speeches, such as “I feel relieved that you are fine.” or “Are you O.K. in such a pale complexion?”, to the foundation of “now” which changes everyday. One of my friends taught me that “Bongen”, which is shortened version of “Bonjour! ‘Gendai Bunmei'”, is the same pronunciation as the name of one of Gagaku (Japanese ancient court music) song. That was amazing music which has multiple sustained sounds starting at random, like that “the diversity of the world” was condensed. It was about one year ago that our story began by the common quotation from Tadao Umesao. 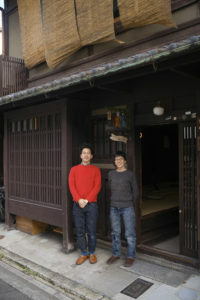 This Machiya was built by my great-grandfather as his second home, during the Taisho Era. There were a number of people who lived there, including my grandparents, their three children, and occasional logding student. I was told that my grandmother washed the household’s clothes by hand, and prepared for everyone many wonderful dishes in the Okudo-san (traditional Kichen). It is easy to imagine how delighted she must have been when she got the ‘mysterious’ washing machine. Sometimes we find truth by finding modest questions to ask. I started this space in order to give people the chance to approach a clearer view of the wolrd through simplicity.